Immune responses can be nonspecifically enhanced or modified by ad ministrating certain substances together with the antigens. These substances, called adjuvants, are obtained from bacteria, viruses, parasites, and plants and are highly heterogeneous with respect to their nature and origin. Probably the strongest and most common adjuvants are substances derived from bacteria, especially Mycobacterium tuberculosis. 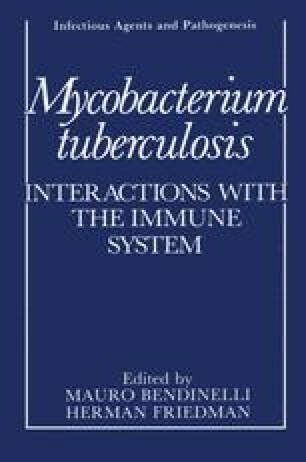 Since the historical experiments by Freund et al.1,2 established that administration of antigens incorporated in water-in-oil emulsion together with killed mycobacteria induced delayed-type hypersensitivity (DTH) and enhanced antibody production, mycobacteria have received a great deal of attention in immunology. Their biologic activities are versatile. For example, the administration of mycobacteria in water-in-oil emulsion induces not only enhancement of DTH and antibody production but also adjuvant polyarthritis,3,4 granuloma formation,5 autoimmune disease,6,7 suppression of tumor growth,8 and increased susceptibility to endotoxin.9 Therefore, many investigators have made efforts to define chemically the adjuvant moieties of mycobacteria. In recent years, Lederer et al.10 identified a minimal adjuvant active structure, N-acetylmuramyl-L-alanyl-D-isoglutamine (MDP), which was then synthesized by Merser et al.11 This molecule has been confirmed to exhibit versatile biologic activities similar to those of mycobacteria and to affect immu nocompetent cell functions.